Volume 5 begain in 2016 and marked a shift to a longer 6-panel-per-page format, and a switch to all-digital art production. Pencils and inks were now done in Clip Studio, whereas previously they'd been done on paper. Colouring and lettering continued to be done in Photoshop. In Volume 5 Plok stands trial in System-Z for the crimes committed against the Skree Queen and her brood in the SNES game. What will the verdict be, and if guilty, what will be Plok's punishment? Meanwhile, Plok's Grandpappy perhaps wasn't as long lost as we presumed, and along with an upgraded Xbone, returns in robotic form to come to Plok's aid. Kinda. With a few stops for resources along the way. 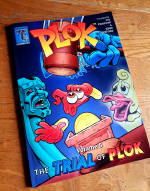 The fourth Plok comic strip edition collects episodes 102 to 126 of the webcomic and includes many exclusive extras. » Available now in paperback. » View all 25 episodes of Volume 5 as a single long webpage. All 25 episodes of Volume 5 are available to read - for free! - right here. Wubba receives a message, and requires a prompt. Wubba's visage is transmitted to System Z.
Captain Skint accidentally starts the 'discovery' phase of the trial. Wubba's acting all weird for some reason. An impartial jury of upstanding citizens is selected. Say hello to Lt. Xenk, System Z's finest! But who owns the copyright to the photo? Plok meets a dodgy used vehicle salesman. Plok puts his foot down while a relative awakens. Xöb dusts off a R@RE classic cartridge. Grandpappy's robot emerges from inside his statue! Lambert's Method or the work of Gauss? Grandpappy speeds to Plok's rescue, after just one more go. 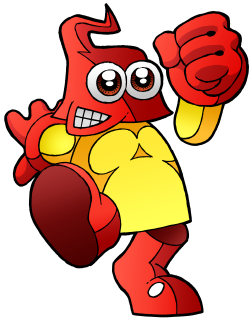 Each of Plok's arms are unique. Not x-flipped, oh no. Plok gets a bit over-excited on console launch day. Warning: Black Holes are not yet completely bug-free. Plok could be sunk by a very compelling piece of evidence. Rockyfella mounts a mean defence! The Jury come to an almost unanimous decision. Plok proves to be a creature of honour. The Bobbins Bros are unanimous.